With lows coming this way across the Atlantic, and gale force winds forecast for our next destination (Madeira), we decided to stay put another week. 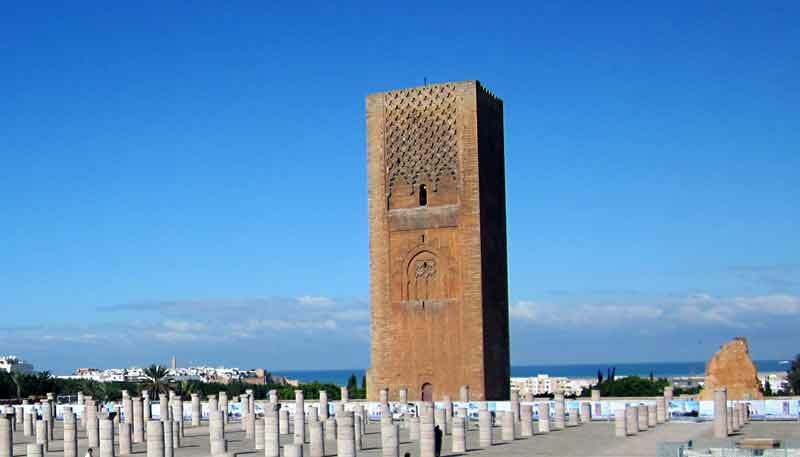 Tuesday was sunny so we walked over the bridge to Rabat and up to one of the most prominent landmarks, the Tour Hassan, and nearby mausoleum for the king's grandfather. The Tour stands by the ruins of a mosque that was destroyed in the same 1755 earthquake that hit Lisbon. It must have been a massive quake, destroying buildings across northern Morocco. From there we made our way westward, passing through the medina, hoping to visit the museum in the Kasbah. But no luck - Tuesday is closing day for museums in Morocco. Instead we treated ourselves to a seafood lunch at one of the restaurants by the beach and caught the passenger ferry (a small rowing boat) back to Sale. It was sunny again on Wednesday, so we took the train to Meknes - the first of Morocco's four imperial cities. We've now visited all four, in reverse historical order. 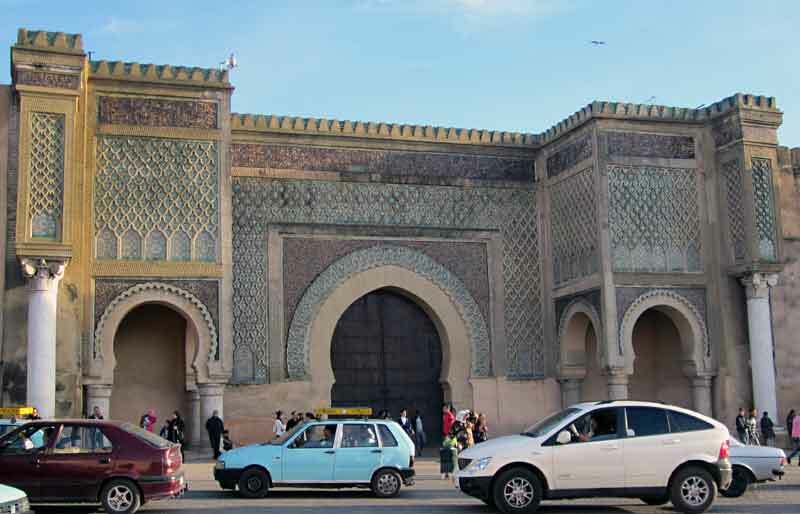 Meknes' heyday as capital was in the 18th century and it too suffered badly in the 1755 quake. We stayed overnight in the new town, paying a short visit to yet another meandering medina, getting lost and ending up in the gold souk where the security guard kindly pointed us in the right direction. Meknes is smaller and much more relaxed than Marrakech and Fez. We liked it a lot and also enjoyed staying in the new town, giving us a much broader view of modern Morocco. 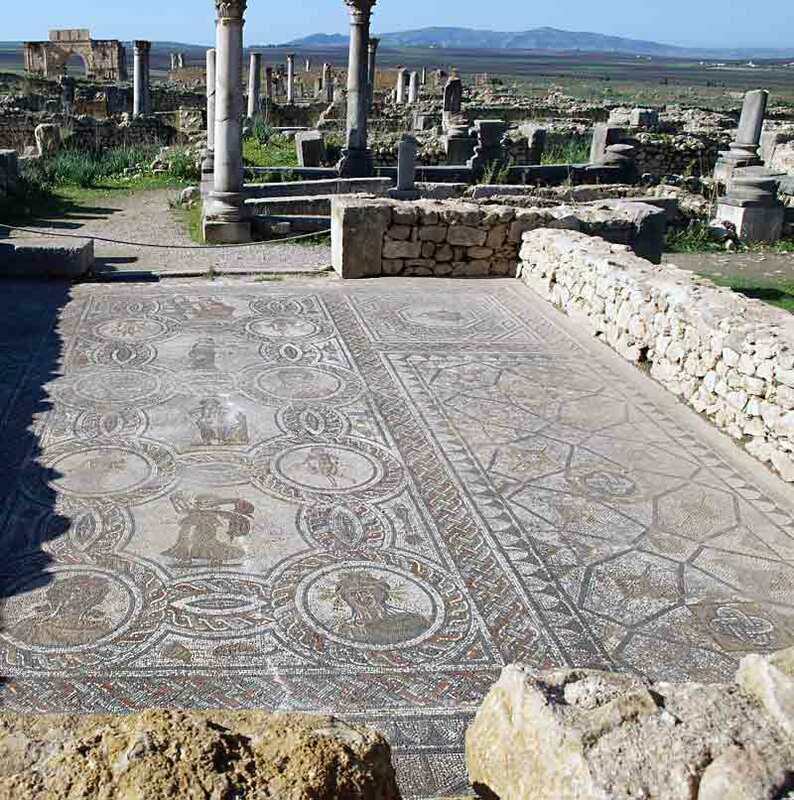 Just a short drive from Meknes, set in the middle of an area of fertile farmland is Volubilis. It was built by the Carthaginians and developed by the Romans and was still inhabited up to the 18th century when it was also a victim of the 1755 quake. Visited on an autumn morning before the tourist buses arrive, it's really special. 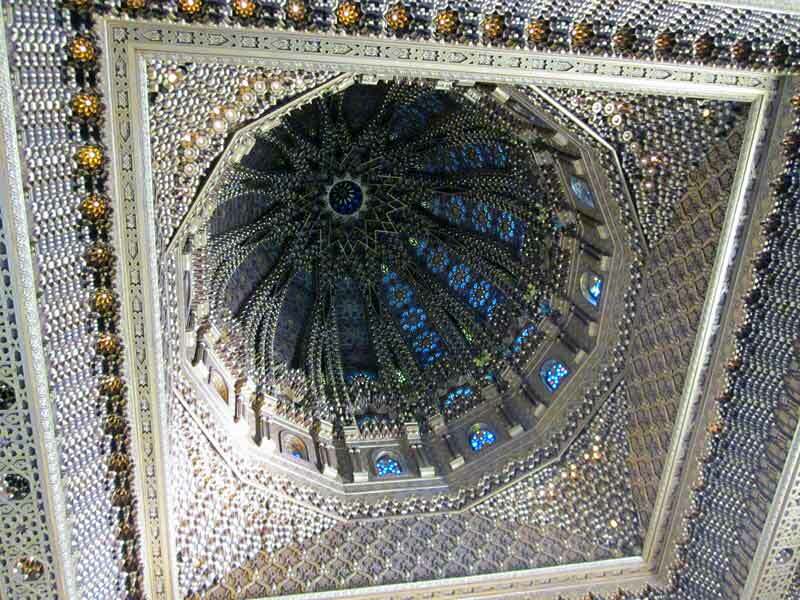 We declined to have a guide and wandered around identifying the different buildings ourselves (from a map we got off the internet), enjoying discovering the different mosaics and taking photos in our own time. 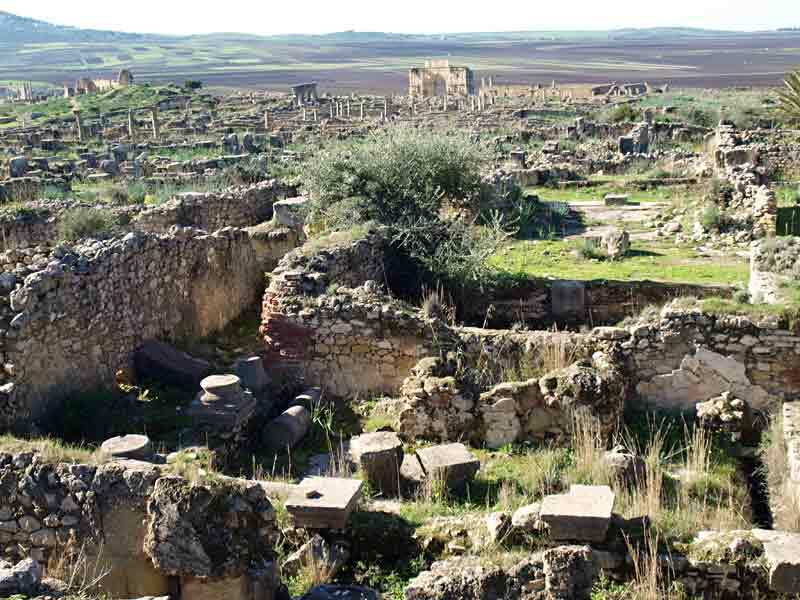 One of the reasons they chose this site for Volubilis is the fertility of the surrounding land. Olive groves abound and now that there has been some rain the fields are alive with activity. Tractors as well as donkeys were preparing the land for autumn planting. 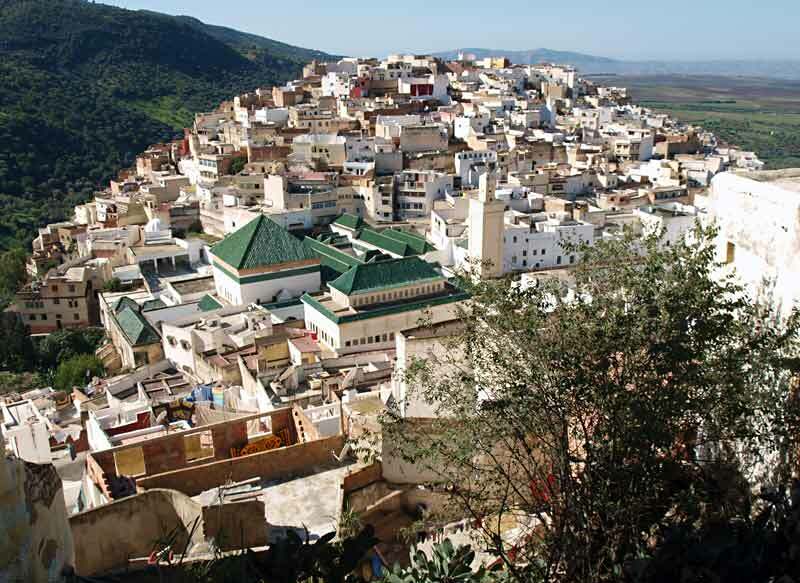 A few km from Volubilis is the town of Moulay Idriss, named after the man who brought Islam to Morocco in the 8th century. It's a pretty hill-top town and top pilgrimage site. Back in Rabat Paul succumbed to another tummy bug and woke up on Friday morning in great pain. When asked for a doctor the marina staff called up an ambulance and we paid a visit to the local hospital. The medics were kind but spoke almost no English. After some prodding the patient felt better and was sent home with lots of pills to take. He has now recovered but rattles when shaken.